So I think we can call last year on the blog a reasonable success. I wanted to blog twice a month, I wanted to cook 2 things a month from my new recipe book and most of all I wanted to stop myself from being all feast and famine in writing terms. I didn’t entirely succeed, I only made 20 posts last year, but that was an improvement on the previous year’s 15 and while I didn’t cook two things from the cookbook every month, I did cook something from the book almost every month. And most importantly, for the first year ever, I managed to write at least one thing each month! Hopefully I can keep that up, along with writing – and much, much more importantly cooking – more. This year, I have decided on two separate challenges to keep me writing (and cooking for that matter) on a regular basis. 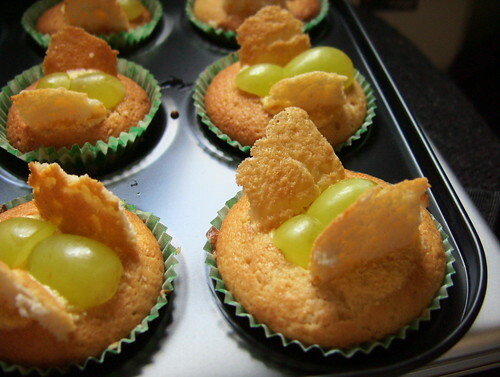 First up, I want to bake something new each month this year, sweet or savoury, it doesn’t matter. Despite us now having a better oven, I’ve barely baked in it. I want to master baking in this oven. I miss it and its an important part of how I relate to my colleagues – I like being the kind of workmate that appears sporadically with home-baking. Secondly, I plan to work my way through the other recipe book I got last festive season – How to be a Better Cook by Lorraine Pascale. As I’m going to be doing two different challenges, I’m only going to try and cook one recipe a month from the book – unless the thing I’m baking that month is also from that book! Well, at least one of my foodie resolutions is going well. So far this year I’ve baked three times, which is the same amount that I managed all year in 2014 and its only March! Today I want to talk about the two items I made that were also on my big 30 recipes list (I’m now up to 23 recipes tried) which is an extra kind of progress. Technically one of those baking incidents was actually two because it was across the Friday and Saturday of an epic weekend of baking. Why am I calling it one baking incident instead of two? Well it’s silly really, but when it comes down to it, as a novice cook, determined to learn to cook properly there’s a lot of snobbery out there about ‘cheating’ at cooking. (Bless Delia Smith for her campaigning against this kind of nonsense, I may not want to cook her recipes but, she’s a kitchen legend for a reason.) I stand by my statement that life’s too short to make your own puff pastry, yet still that little niggly voice says ‘well, its not really baking, is it’. Which is nonsense. 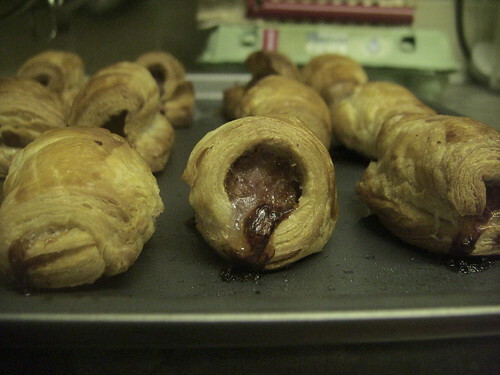 Between pummelling the pastry into submission so they didn’t attempt to take over the world, carefully trimming the sausages to fit perfectly, and making sure the rolls stuck together properly, it certainly felt like baking. Also I suspect I’ve ruined their mini frozen cousins for myself which to me is always a sign that I’ve done some proper cooking. Next stop learning to make my own veggie sausages for them! 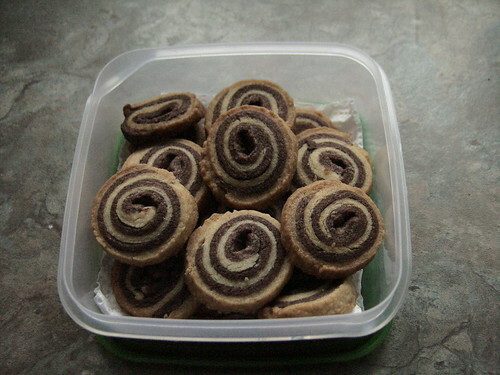 The other bake that I want to talk about is the batch of Bite-size Pinwheel Snacks that I made as a Cheerio Biscuits for my workmates on my last day working there. Normally when recipes say ‘tiny’ or ‘bite-size’ they aren’t even close – and make you wonder about the size of said chef’s mouth – but these actually are, perfect when you’re baking for a team of people where at least half of them are on diets. They are a bit of a challenge though they actually look more complex than they are. The mixture is really quite dry (not an egg in sight!) and I was quite worried for a while about it coming together until I thought to just get my hands in there and knead it into submission (you add the chocolate to half the mixture by kneading it in so I figured that it couldn’t hurt) after which it behaved much better. They turn out to have a pleasantly short-bready texture to them, which I enjoy. Due to not actually liking chocolate as a child – I’m still much more a crisp hand even now – baked goods in my childhood were chocolate free and it mostly doesn’t occur to me to use it when I’m baking myself now. To the extent that when I came to having to buy cocoa powder and was faced with the range of options I plumped desperately for the ones I’d seen in my Inverness flatmate’s cupboard – he made really good chocolate brownies, alright! So this was actually my first attempt at cooking with chocolate and my goodness you get in a glorious mess! Oddly enough the most frustrating bit of the process isn’t weighing and dividing the mixture or even rolling the two batches together like a swiss-roll, but having to chill the mixture in the fridge for half an hour – twice! The first time was fine, it gives you time to do the dishes, but second time round I’d run out of things to do. Definitely one to do on days when you’re making several different things. 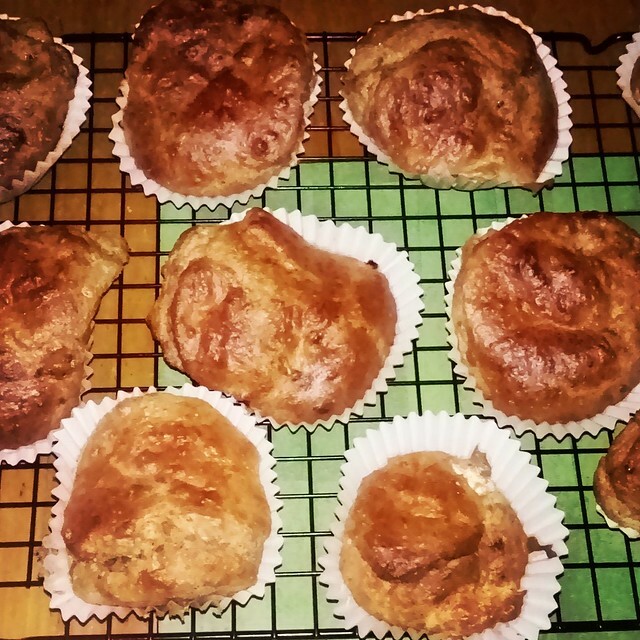 Mine weren’t as neat and tidy as the recipe-book picture, but I’m sure I’ll get tidier with practice.